Phi Kappa Phi is more than a line on a résumé. The nation’s oldest and most selective multidisciplinary collegiate honor society initiates more than 30,000 members a year on 300 campuses in the United States and the Philippines. 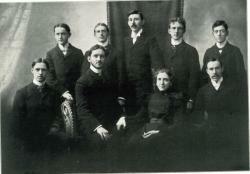 More than 1.5 million members have joined its ranks since Phi Kappa Phi’s founding in 1897 at the University of Maine. It is a global network of the best and brightest, a community of scholars and professionals building an enduring legacy for all generations. The Honor Society of Phi Kappa Phi's primary objective is the recognition of superior scholarship in all academic disciplines. The society is convinced that recognizing and honoring those persons of good character who have excelled in scholarship, in whatever field, will stimulate others to strive for excellence. Moreover, the society serves the interests of those students capable of excellence by insisting that in order to acquire a chapter of Phi Kappa Phi, an institution provide the means and atmosphere conducive to academic excellence. Stanislaus State has proudly supported Chapter 282 of the Society since receiving its charter in 1999. Phi Kappa Phi was born different. In 1897, 10 senior students, 2 faculty members and the University of Maine president created a new kind of honor society, one that recognized excellence in all academic disciplines. Today, Phi Kappa Phi recognizes and promotes academic excellence in all fields of higher education and engages the community of scholars in service to others. The Stanislaus State Chapter 282 was chartered in 1999. Since the Chapter was chartered, over 1100 members have been inducted into the Society. The Chapter has received special recognition from the Society on three different occasions, including the Chapter of Merit (2014) and Chapter of Excellence (2015) Awards. Most recently, former Chapter President Janice Herring was named Regional VP of the Society at the national biennial in 2016. What is Phi Kappa Phi is up to today? Check out our latest news to see how the Chapter and Society is making headlines nearly 20 and 100+ years, respectively, after its founding. "Let the love of learning rule humanity"